Delhi is glowing bright: is it really? The Delhi state elections are getting nearer and the government is trying its best to inform people about its achievements and schemes. The result is that everyday in the Delhi edition of the various newspapers one can see the Delhi government's advertisements. In the last few elections, various state governments have taken up advertisements very aggressively. I wonder how much the tax payer has to shell out for these advertisements that in a way further the ruling party's cause. Anyway, I found the advertisements on electricity very interesting. First of all, keeping to the traditional, non nuanced way, one of the advertisements connected electricity to light by saying that 'Delhi is glowing bright'. I wander what this brightness refers to? Does it mean that Delhi residents use the most powerful and the brightest bulbs? Does it also mean that brightness is the desired and more brightness is better? I wonder what the western academics arguing for less lights in the cities would make of this? I wonder what Delhi government would say if the people choose to use all equipment other than bulbs? So, how is Delhi glowing bright? 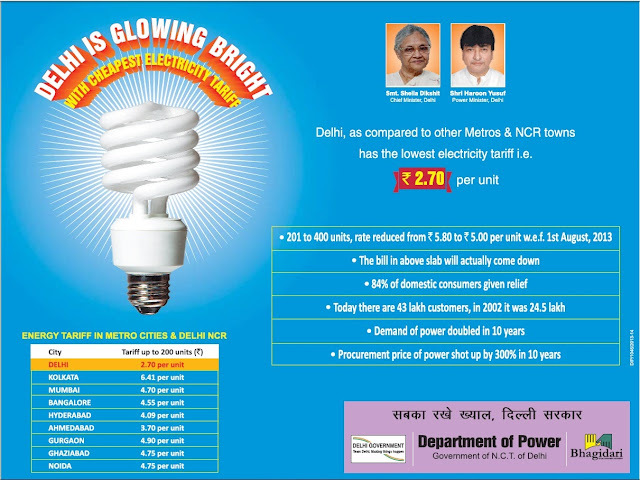 Simple, compared to the other cities in India, it has the lowest electricity tariff (as the ad above suggests). This gives Delhi residents reasons to glow. 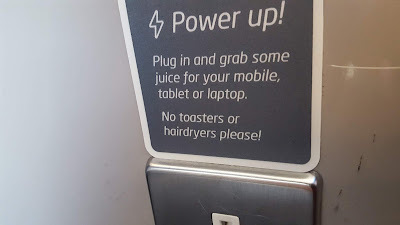 It gives them reasons to use as much and more electricity as they need, want or desire. Talk about subsidies and talk about unreasonable subsidies. But, has this sop of cheap power worked in Delhi. The ad below tells that it has. Apparently, Delhi has the highest per capita electricity consumption in the country. And this highest per capita consumption of electricity has been connected to development by the government. The Hindi script in the advertisement below says 'development is visible here'. So, high per capta electricity consumption is a marker of development and Delhi's brightness is a marker of its development, its 'visible development'. highest development or highest wastage? (Courtesy: Hindustan Times). This advertisement shows the photograph of a mall. Malls with their excessive lighting and cooling arrangements could easily be seen as the representatives of electricity wastage. Lots of development has led to lots of electricity which has let to lots of brightness in Delhi. But in the same ad above, Delhi government also says 'Save Electricity'. This is where a critical question arises. Do the people of Delhi waste more electricity compared to other cities? Could that be why they have highest per capita electricity consumption? Could it be that Delhi is not actually glowing bright (literally and metaphorically) but that it is highly inefficient? Could it be that Delhi is not actually showing development? A close look at all the advertisements above also gives us some insight into the connections between light and electricity. Light seems to be the 'visible electricity' and is being used in these advertisements both literally and metaphorically. Women are being seen studying, a CFL is glowing bright with its white light. CFL is also being seen as representing energy conservation and electricity saving. Several jobs are being seen within the icons of light bulbs and a group of people are surrounding a light bulb, possible representing conservation of energy. Could these visible representations be effective or even possible with anything other than a light bulb? Is this representative of our social association with light? Does this representation of light polarise or premeditate our associations with energy?